Everyone sets out in the business world to have a great brand online, but few get it right without a bit of effort. Many set out with great intentions for having a well-loved brand with a wonderful reputation. What stops them? The most frequent excuses we hear are low budget, lack of time to spend learning or actively managing their brand online, or ignorance. Lucky for you, building a positive brand online doesn’t have to be incredibly costly or time consuming. In fact, for most businesses, a great reputation online can be achieved by following a few simple guidelines. Do: Know Your Audience. Know who you’re trying to attract, and address them accordingly. Consider the tone, verbiage, subject matter, and content you are utilizing to share with your audience. This will ensure that you get the maximum benefit across online channels. If you don’t know who you’re marketing to, your message is just being sent out into the wind. Don’t: Try To Attract The Wrong Audience. Make sure you know who you’re engaging with before you solidify your strategy for developing your brand’s message. Keep in mind that you may be communicating with a different group of customers on Facebook than on your blog. Your local community and your online community may be different. Craft your message accordingly. Do: Engage. Utilize online mediums to your advantage by engaging with your customers, peers, and even your competition. Get feedback, suggestions, and let others help spread the word about your brand. People are much more likely to trust the opinions of their peers about your business over what they hear via advertising or directly from you. Let your customers and fans become your evangelists! Don’t: Push. Marketing messages are pushed at people everywhere they go; they are seen on television, print media, online, even on billboards at the side of the road. Don’t be more noise that gets tuned out. Be part of the conversation! Do: Listen. Always listen! Relying solely on push marketing can be a fatal mistake, especially when you’re marketing via social media. Make sure you’re taking the time to really hear what your customers have to say. Know what they love about your brand or industry as a whole, what they’d like to see change, and listen to ideas or suggestions they have for improvement. You never know who may help you elevate your brand’s image – sometimes inspiration comes from unlikely places! Don’t: Ignore. People are talking about your brand because they’re invested in it. Whether that investment is positive or negative, let them know that you hear them! Take a moment and respond to what they have to say. Even if you can’t change how you do business for them, just knowing that you are listening is often a large part in turning a harsh critic into a lifelong fan. Do: Move Tough Conversations Offline. In the event you have an unhappy or angry customer, take time to let them know publicly that you want to do whatever it takes to resolve the problem, and be sure to give them the name and contact information of a decision maker within your company to contact for next steps. Don’t: Argue. Especially in a public forum. No matter who may be right or wrong in a conflict, customers often come away from a public conflict with the sympathy of their peers while the big brand is vilified. Take the argument offline, to help prevent the airing of dirty laundry that often happens when brands try to settle disputes with the whole world watching. Do whatever it takes to avoid back and forth arguing in a public forum in order to remain professional and courteous. Do: Say Thank You. The life of your brand depends on its partners and customers, so let them know that they are appreciated! Commenting on the positive feedback out there is just as important as addressing the negative –don’t let your fans be ignored, or they will stop talking about you. Don’t: Take A Great Audience For Granted. Brand evangelists are your unsung heroes – they are your unpaid sales and marketing team. They take the time to tell anyone who will listen that they love you. Make sure you take the time to tell them that you appreciate their enthusiasm and love for your brand, and they’ll continue to share the love. The bottom line, when brands listen to their customers and actively work to show their appreciation for those customers, those customers stay loyal, happy, and incredibly vocal. 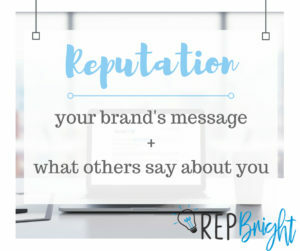 Imagine the impact if you made a comment online about someone you do business with and they took the time to acknowledge your feedback and do something about your comment or suggestion – you can be that brand for your audience!